ching, as in Tao Te Ching, or I Ching, sacred book: warp. When I agreed to write a response to Cecilia Vicu�a�s Cloud-Net, I thought that I would slip into it as easily as one slips into her work, that �responding� would simply involve a somewhat descriptive analysis, an enthusiastic pointing out of what I admire and find fascinating in what Vicu�a does. But the more time I spent with the book, the harder it has been to write about it. One reason is that so much of what makes Cloud-Net work is embedded/embodied in materiality and performance, grounded in ephemerality and transformative ritual. The remains (traces) of a project like this can be represented pictorially�as this book shows most beautifully�but the next step, to make words of my own that were not already made redundant by Vicu�a�s realizations, seemed almost impossible. Not until I found myself talking with the book�using Vicu�a�s words as a warp against which to construct a weft of commentary�did my work feel at all productive. Writing as weaving is one of Vicu�a�s central metaphors, but it�s important to remember that dialogue implies a space, in at least two dimensions. Lines of communication don�t merely answer a with a and b with b; but open up �new� places, too. Vicu�a has been working with thread for most of her career, tying, fastening, pulling together. Looking at her earlier work, I see photos of little bundles of litter (basuritas), wound round with cord, memorials of resistance to the 1973 coup in her native Chile, and constructed in London; threads passing between stones and trees and over rivers, high in the Andes; a room in Holland strung with geometrical lines that catch the sunlight, and then here, in this book, gallery spaces hung with soft hammocks of unspun wool in Houston, Buffalo, and New York. This is only a selection; lines of straw and twigs also find their way over Chilean beaches and are laid gently into New York gutters. bones, sticks and feathers were sacred things I had to arrange. The Cloud-Net book, which is documentation for that performance, and for the exhibition in its various embodiments, follows roughly the same ritual structure: first setting up, then letting go. ������The poems and photos in the first half of the book set up looms and make nets. 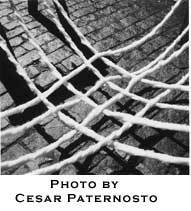 They document the Cloud-Net video, with stills of a cat�s cradle of threads running/being run along a pier; they show us photos of heads wrapped in nets (Vicu�a herself, in work dating from 1969, and an eighth-century illustration of the Mayan god Pawahtun), and they point up the webs in window-frames and cobblestones, the spokes of a bicycle wheel. This is the start of a poem that is made out of commentary by Dennis Tedlock and others on the text of the Popol Vuh, described in Vicu�a�s notes as �the Quich� Mayan book of creation.� Vicu�a has homed in on the interpretation of a single phrase, showing that close scrutiny of the syllabic signs of Quich� Maya may not result in any one meaning. Instead, the process seems to open out layered threads of possibility; words that have to do with writing, knotting, and the names of gods slide over each other, connected but refusing to be tied down. ������The second part of the book both meditates on and enacts processes of fragmentation and dissolution. It includes the contents of the three �poet�s tables� that Vicu�a constructed for the exhibition�s three venues, tiny sculptures made of trash, which she calls precarios, or prayers. Lists of their titles, some in Spanish, some in English, form three poems. ������In his discussion of Vicu�a's precarios, �Cryptic Weaving,� Hugo M�ndez-Ramirez mentions the phrase �al filo del agua,� which he translates as �on the edge of disaster.�(Precarious 60) Whether figured as �down to the wire,� or the thread of water as a precipitous edge, this phrase seems to encapsulate the vulnerability of the precarios,�a suggestion, perhaps, of the drop below the net that becomes apparent at moments of great danger. Has the earth lost its cool? Did we lose a moist place within? A place where tolerance and moderation reside? As the weather becomes more extreme, the difference between rich and poor intensifies, diseases go wild, and the poet dreams of enlarging her stitch, of cooling herself and the earth at once. Here the haze, illustrated by photos of buildings obscured by rising steam from heating vents, becomes the smoke of the oracle pouring through a crack in the earth. The last few photos show white woolly threads, oddly comforting, laid over rooftops. Caterpillar-soft, a thick white line is swung across a flat roof, climbs up and over a stepped gable. Finally, as described at the beginning of this essay, a fluffy cable swings up on a steep diagonal, connecting earth and sky. If, at the beginning of time, poetry was an act of communion, a form of collectively entering a vision, now it is a space one enters, a spatial metaphor. At the center of the book, where I have made a division between its two halves, a small and very simple black and white image: one thread laid over another. A cross(ing). Heart of a weave, simplest kind of knot. Knitting, lace, and crochet are based on knots, and the most basic kind of stitch (for fastening, or embroidery) requires that resistance�the thread against itself, or against another. This project is fabricated out of translation: translation of metaphor (between material and spiritual, poetry and artwork), and translation between languages (English, Spanish, Quich� Maya). Not all the Spanish also appears in English; specificities (knots, cruxes?) are important. Where the translation reads across facing pages, it�s as if there�s a third poem that hangs between. Sometimes Alcal�s English words are directly opposite their equivalents in Spanish, sometimes they appear at a diagonal. As I try to write and explain this, I find myself making cross-shapes in the air with my fingers�the same movements one uses to hook up the string of a cat�s cradle. Vicu�a, Cecilia. Interview, conducted by Charles Bernstein. Granolithic Productions, 1996. Also available at http://wings.buffalo.edu.epc/authors/vicuna. _____. Cloud-Net. Trans. Rosa Alcal�. Art in General, 1999. Vicu�a, Cecilia et al. QUIOem/The Precarious: The Art and Poetry of Cecilia Vicu�a. Ed. M. Catherine De Zegher. Trans. Esther Allen. Hanover, NH: Wesleyan UP, 1997. BIO: Born in England, Anna Reckin has been living in the USA since 1995, and is currently studying in the Poetics Program at SUNY Buffalo. Her poetry has appeared in Chain, Prosodia, Key Satch(ell), and The Texas Observer. Broder, her first book, can be found in the mixed media section of this issue.